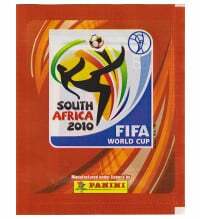 The 19th World Cup took place on the African continent, in South Africa, in 2010 for the first time. 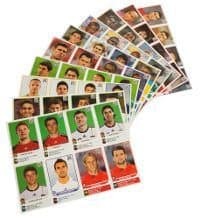 This premiere provided an opportunity for Panini to create a very special football collector's album. 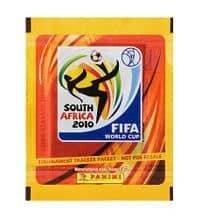 The collector's album Panini South Africa 2010 appears in the typical African colors yellow, orange and red. The very warm colors convey the South African way of life which could not only be experienced as a spectator at the World Cup. 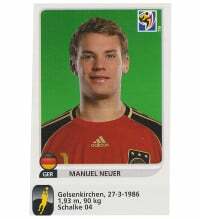 Panini put this vitality into the collector's album, as well as in the individual packets and could arouse the collectors' enthusiasm by this means. Let yourself be surprised by this very special joy of collecting. The slogan of the World Cup was: "It is time to celebrate Africa's humanity". This motto should express the warmth, friendliness, modesty and humanity of its people. 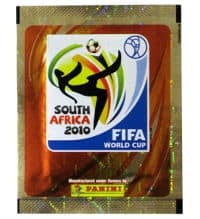 Panini also incorporated the motto into their collector's album. 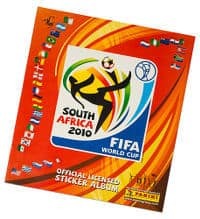 The album Panini World Cup 2010 consists of 76 pages which express the warmth and friendliness of the continent. 638 stickers can be put in the collector's album. 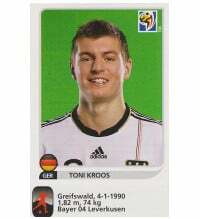 The stickers do not only include the players and teams but also the stadiums and the mascot. In addition, there are two special images with the numbers 00 and 000. 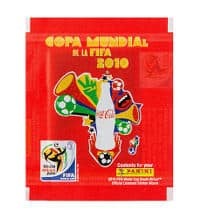 Behind the first number, the collector can find the World Cup poster "My game is fair play" and behind the 000 there is the so-called stamp. 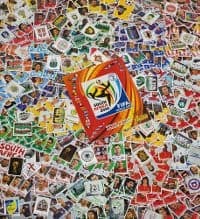 The complete set Panini World Cup 2010 contains 640 stickers in total. 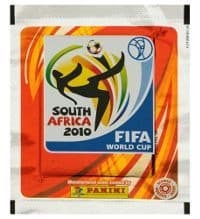 The sticker packets are also designed in the warm colors red and yellow. 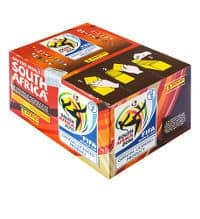 Depending on the nation, the packets are available in different colors. The German packets for example are red, whereas the Eastern European packets have a silver edge. 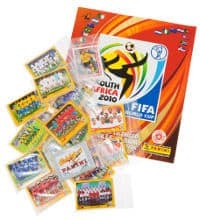 The number of stickers, however, is the same for each packet: 5 images. 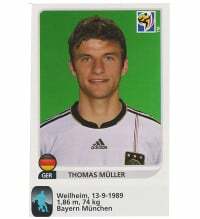 Since there are always post-nominated players which weren't planned as part of the National Team, there is also an update set with 80 images in this Panini World Cup series. 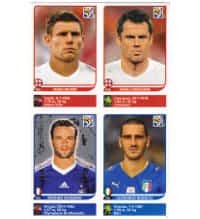 On these stickers, you can find the players that weren't considered in the album. 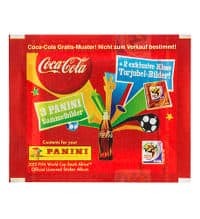 In Germany 4 stickers of Coca-Cola came out that could only be received with the purchase of a crate of Coca Cola. On these images, you can see the goal cheer of Klose. 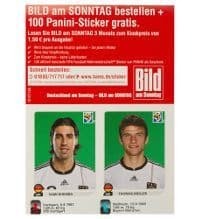 In Switzerland 20 special stickers came out that were marked with the numbers P1-P20. 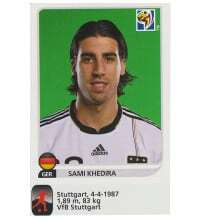 These images are only available in the Swiss series. In the United Kingdom edition, a poster, on which 22 stickers could be put on, was inside the album. The stickers displayed Morrison's "Tournament Tracker". 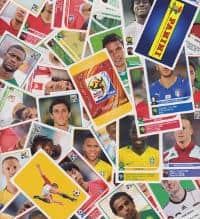 In Brazil 9 additional stickers and images could be stuck in the collector's book. 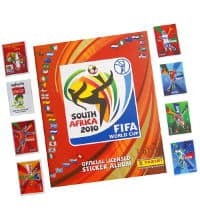 Also in Chile, the Panini World Cup 2010 album has some particularities: "Pop-up" images (non-sticky) as well as 8 images A-H by Coca-Cola and additionally 9 Jabulani football puzzle images were released. 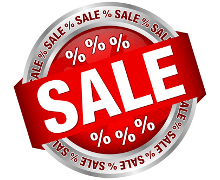 In our shop, you can experience some of the above listed particularities and be fascinated by the joy of collecting. 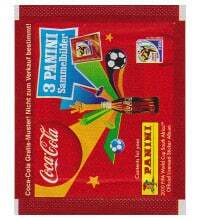 We offer you various products concerning the Panini World Cup 2010. Get infected by the collecting fever of stickers.